"I started this mission. I will finish this mission." Well Go USA has revealed a new official US trailer for the action comedy from China titled Railroad Tigers, about a "ragtag" group of freedom fighters who ambush a military train. Jackie Chan stars, playing a railroad worker who leads a team of skilled fighters trying to take out the Japanese in order to get food for the poor. Also starring Huang Zitao, Wang Kai, Darren Wang, Alan Ng and Sang Ping. The first teaser trailer for this was goofy, and this trailer isn't that much better, but at least the VFX aren't as bad. I really, really wished this looked better than it does, because it would be nice to have another fun Jackie Chan movie, but I'm not sure this is one. In theaters starting today. In this action-comedy caper harkening back to Jackie Chan's classic Hong Kong films, a railroad worker (Chan) and his ragtag group of freedom fighters find themselves on the wrong side of the tracks when they decide to ambush a heavily armed military train filled with desperately needed provisions. Unarmed and outnumbered, they must fight back against an entire army using only their wits, in a series of a dazzling set pieces and action scenes rivaling anything seen on the big screen before. 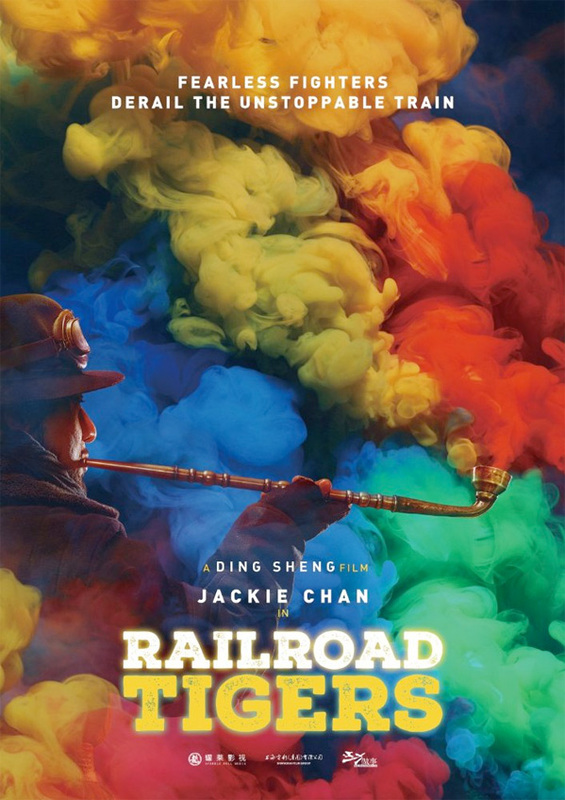 Railroad Tigers is directed by veteran Chinese filmmaker Ding Sheng, of the films Underdog Knight 1 & 2, Little Big Soldier, Police Story: Lockdown and Saving Mr. Wu previously. Well Go will release Railroad Tigers in select US theaters starting January 6th, 2017 - arriving this week. The film has already opened in China as well. Interested? Poor Jackie. He is too old for this. I hope he used his stunt double liberally. Great cinematography and choreography. I can watch this any day over the dumb F&F crap. I like the design a la Saul Bass of the title sequence. I was gonna say, I wanted to see more of the animation in the trailer than the movie clips! HAHA! Cool poster though! True. I like the burlesque style, and Jackie Chan excels in it. The only one who beats him in comedy is Stephen Chow. This guy is the Asian Tex Avery.